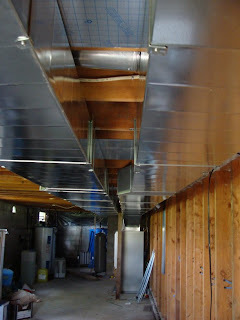 There have been guys in the house on and off for a couple of weeks now, putting in the ducting for the geothermal system. Today the drilling rig turned up and started on the first of the five deep wells that will be needed to sink the pipes down into the rock (we don't have enough depth of soil to lay the pipes horizontally). 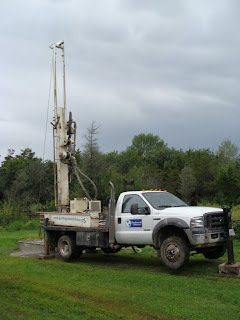 They needed 300 gallons of water to do the drilling, which they took from our well. It's lucky they weren't trying to do this last year, as there wouldn't have been 300 gallons in there then. 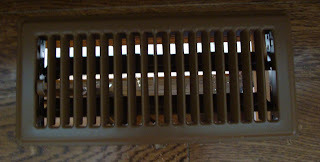 Inside the house, conversely, the work is continuing apace - there are now grilles like the one below in the floors of the downstairs as well as vents in the ceilings of the upper floor (those look a bit like smoke alarms). In the picture below you can see through to the window in the basement, but they're busily connecting all the grilles up to ducting and the geothermal unit in the basement, so that won't be the case for long. Here's the view in the basement. Very shiny. The big silver box in the lower middle of the shot is the geothermal unit. What a brilliant bit of kit to have in the back garden! Your kids must've loved it. Wonderful way to heat your home too. 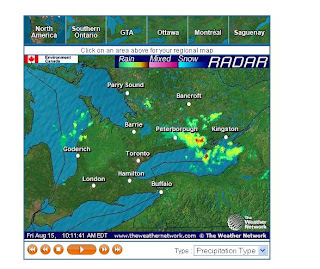 Hope it all goes smoothly when the storm passes. Watch out. My parents built a new home on a acreage a few years ago, and it's taken till now to get all the tweaks worked out in their geothermal system: for a year or two it either quit, overheated the house, or kept it too cool. Their vents look like the ones you explain--smoke detectors. They're easier to adjust, that's for sure, ad they don't get stuck! I love drilling and all that stuff. I had a client the other day where they had to drill straight down through nearly 60 metres of clay before they found the rock (and therefore the water). Lots of yummy sludge. One day I will tell my best drilling story: involving lashing rain, encroaching darkness, broken compressors, extreme cold and wellington boots full of icy mud. Such nail biting drama and hugely satisfying (and, of course, so very dull for everybody else). Interesting that all the comments on this post are from men - nothing like a big bit of machinery to get you going! Benjamin - thanks for the warning. I'm hoping that the technology might have improved since the early days of geothermal, but time will tell.